The Azalea belongs to the tribe of Rhododendrons, and consists of upright shrubs with large, handsome, fragrant flowers, often cultivated in gardens. The genus comprises more than a hundred species, most of them natives of China or North America, having profuse clusters of white, orange, purple, or variegated flowers, some of which have long been the pride of the gardens of Europe. The general characteristics of the genus are a five-parted calyx, a five-lobed funnel-form, slightly irregular corolla, five stamens, a fivecelled pod, alternate, oblong, entire, and ciliated leaves, furnished with a glandular point. Most of the species differ from the rhododendrons in having thin, deciduous leaves. Some botanists unite the genus azalea to rhododendron. North America abounds in azaleas as well as in rhododendrons, and some of the species have long been cultivated, particularly Azalea nudiflora and Azalea viscosa, which have become the parents of many hybrids. Both species abound from Canada to the southern parts of the United States. Azalea calendulcea, a native of the South, is described as frequently clothing the mountains with a robe of living scarlet. All the American species are deciduous. 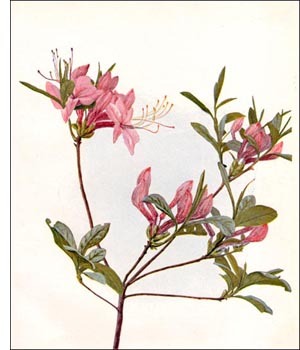 In cultivation, the azaleas love the shade and a soil of sandy peat or loam. Works on horticulture give specific and elaborate direction for the cultivation of the various species.